The quote – „The whole is greater than the sum of its parts“ – rings true in the world of Skuja Braden. Who is Skuja Braden? Skuja Braden is a pseudonym and the alter ego of Latvian artist, Inguna Skuja and California artist, Melissa D. Braden. They grew up in completely different environments with some interesting similarities – Braden, whose family originates from Ireland, were amongst the earliest settlers, farming in Lincoln, California – Melissa’s education is rooted in Modernist and Post Modernist ideologies, while her past epitomises the rise and fall of the American Dream. Skuja received a classical education, rooted in traditionalism while attending The Latvian Art Academy in Riga, but grew up in a Soviet frontier town on the River Daugava, originally called Stuchka, formed during the building of the biggest Hydro-Electric Dam in the Baltics. The town later renamed Aizkraukle is the newest and most purely Soviet city in Latvia. Surprising similarities can be found in the pasts of both artists while their differences help to add a unique vibrancy to their work. They had been working collaboratively for 5 years when their circumstances altered due to the negligence of an immigration attorney hired to obtain a visa for Inguna. This meant she had illegally overstayed her initial visa. 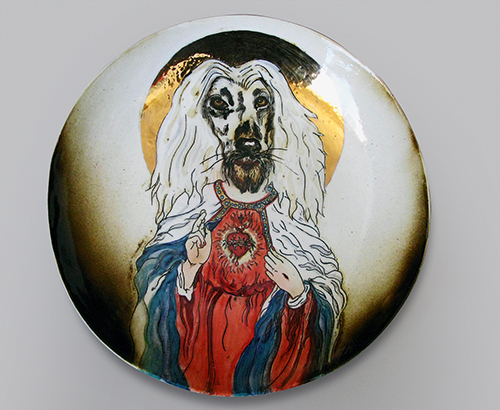 They had just won a $70,000 commission for a public art project, through the White Memorial Medical Center in 2003, so Melissa formed a company, Skuja Braden Porcelains based in Sacramento, CA, combining their surnames in order to hide Inguna’s identity. This way they could continue to live and work together without the fear of her suddenly being deported. Strange things exist. This is just as unforeseeable as it is unavoidable, even if, with our obsession with safety, we seek to avoid it in our lives. The first impression of strangeness is deceptive, ambiguous and ambivalent. It seems to lie in the nature of the strange that we cannot help being initially deceived by it. Having very little or scarcely any similarity with what we are familiar with, at the outset the unexpected gives no indication of its nature. But opinions differ about strangeness right from the start: Furthermore, we cannot help perceiving strange things in terms of what we know and what we are familiar with – each according to their abilities. As if it were automatic, we begin to sort and label, inserting a filter in our perceptions. Something always becomes visible through this. But fundamentally it remains uncertain whether this “something” stems largely from the strange phenomenon or perhaps from the perspective filter employed, a whole range of previous knowledge and prejudices. Everyone brings forth the tools they make judgements with, previous stories believed or vouched for, integrating and comparing the new strange phenomenon. Or they classify it as nonsense, incompatible with everything that has gone before, excluding it as unacceptably singular. It has become fashionable for art to concern itself expressly with occupying previously undefined spaces, not to observe rules and regulations but to present itself at the moment of its emergence as incomparable, inasmuch as this is possible, as a unique work. Elisabeth Fischer was born in Bonn in 1963. She grew up with ceramics. 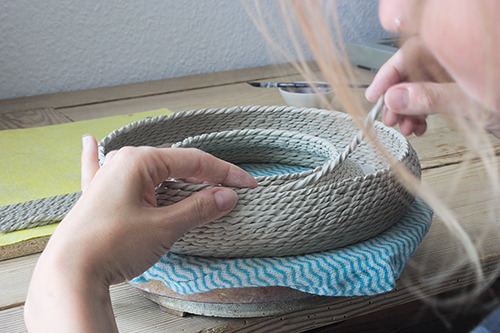 Her grandfather was a pipe manufacturer in the Pleistalwerk near Siegburg, her mother was a trained potter. 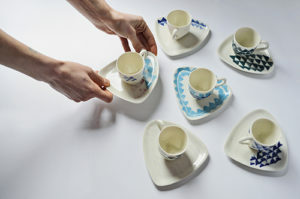 “In our family, ceramics and other crafts were part of our everyday lives. 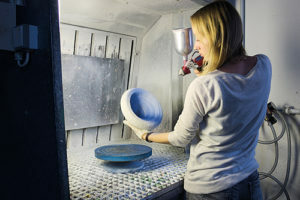 We were always surrounded by beautiful things made of clay.” During work experience in year eight at school, she gained her first practical experience of the creation of ceramic objects at the Heinz-Theo Dietz pottery in Königswinter near Bonn. From that moment, her mind was made up: she wanted to be a potter. At sixteen, she began an apprenticeship with Heinz-Theo Dietz, which she brought to a successful conclusion. The enthusiasm for what the human hand can make from earthen material has not left her even today. 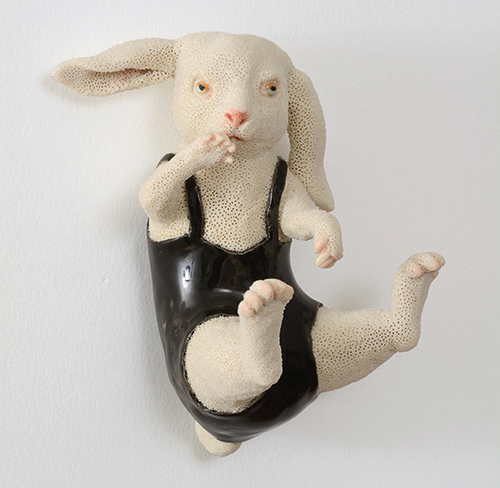 I have always struggled to find my place in the ceramic world, where I fit in. Am I a potter or an artist? I knew deep down I wanted to be creative and develop an artistic career. As a boy growing up in a working class family in the Rhondda Valleys of South Wales, the expectation was I would follow a traditional career path. Wanting to become an artist seemed a strange, foreign idea, people thinking „messing around with mud“ wasn’t a proper job. However I felt a strong desire to express myself creatively but lacked direction. Fortunately when at college, Gwen Heeney came into my life as a tutor, giving me practical skills and confidence to explore my talents to turn my hopes and ambitions into reality. I had never met anyone like her before, she was the first person to express being an artist is a valid profession and I should follow my dreams to be creative. As I developed my interest in ceramics, exploring its rich diverse history, abundant surface decoration techniques, I began to build an artistic palate in clay, overwhelmed by its technical constraints and seduced by its tactile qualities, its potential as a creative medium seemed limitless. Feeling unshackled from form and function, I knew from that moment I wanted to exploit its plasticity and find a way to convey human emotions, like an artist. Frida Khalo painted her feelings I want to find a way to make mine. 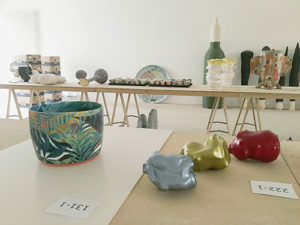 Complex 1 – Your ceramic career: What was your motivation to study ceramics at Berlin Weißensee School of Art? Were your expectations fulfilled? 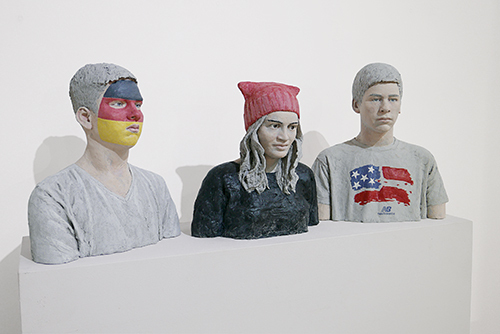 What was more important for your career – the study of art under Bontjes van Beek or the technical studies at the Bergakademie Freiberg (University of Mining and Technology)? How did you come to go to Burg Giebichenstein in Halle and what did you experience there as a teacher? How did your prolific career in publishing about ceramics begin in the West? 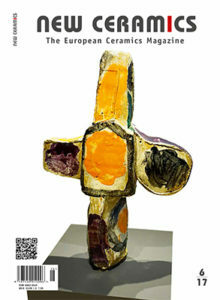 What aims and intentions did you pursue as the founder of the Keramikmagazin? In my home town of Pressburg, which is now called Bratislava, the Bauhaus had a subsidiary. The luminaries from Dessau lectured there. My mother taught weaving at the school. And she was so inspired by it that she wanted me to become a weaver. When I was still a child, she took me along, but I was much more interested by a dog that was lying under the modelling block of a girl student. The lecturer gave me a lump of clay. I made animals. And I was allowed to paint white dots on a blue glaze. Mannheim architect Klaus Freiberger (*1929) assembled a collection of nearly 200 pieces by Beate Kuhn. 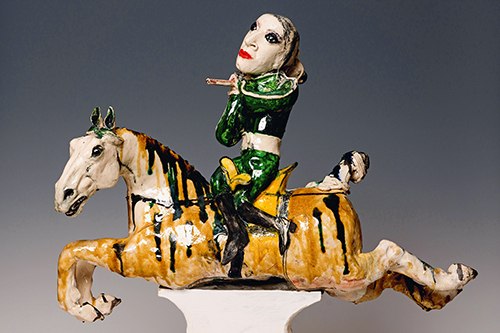 As a collector, he followed and accompanied the ceramic artist’s studio practice attentively – she was only slightly older than him (1927 – 2015) – from its beginnings to her final pieces. From an artist-collector relationship, a close friendship developed over the years, and so did an exceptional collection representing the work of this remarkable artist with significant and outstanding pieces. 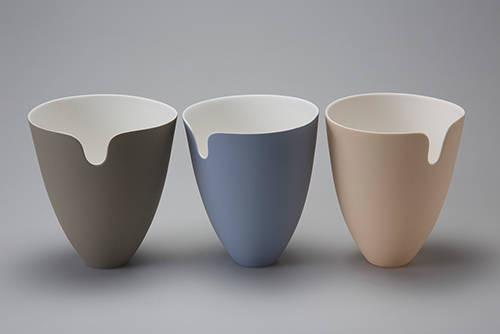 Beate Kuhn’s ceramics were highly regarded from an early stage. As far back as 1957, the renowned gallery of Adriano Totti in Milan put on the first solo exhibition, designed by the architect and designer Ettore Sotsass, also from Milan. 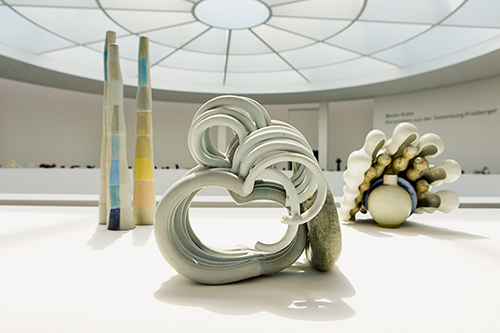 The Südwestdeutscher Keramikpreis – the Southwest German Ceramics Prize – launched through an initiative of the Baden-Württemberg crafts association and the SV-Sparkassenversicherung insurance company, has now been awarded for the first time. 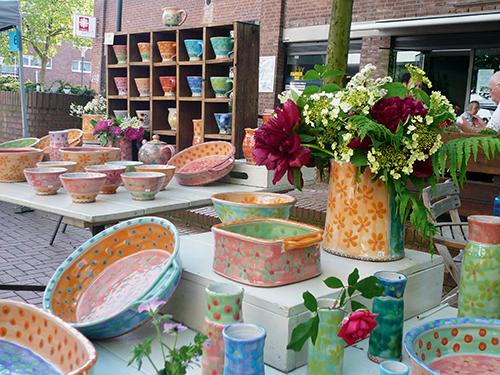 It was initiated to promote ceramics making in the southwest of Germany and to establish a place for artwork from the region on a national and international level. 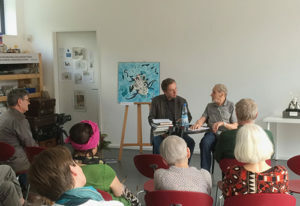 All artists whose medium is clay or porcelain and whose homes or studios are in Baden-Württemberg or the Rhineland-Palatinate were eligible to participate. The exhibition runs until 11 February 2018 at the Keramikmuseum Westerwald, Höhr-Grenzhausen, Lindenstraße 13, Germany, www.keramikmuseum.de and then from 19 May 2018 – 6 January 2019 at the Museum beim Markt, Karlsruhe, Germany. As if things in life come full circle, now with a new eye, how do you describe a giant? If it hadn’t been for Kristin Muller from Peters Valley, who brought me the catalogue from her visit, I would not have heard about the exhibition in time. 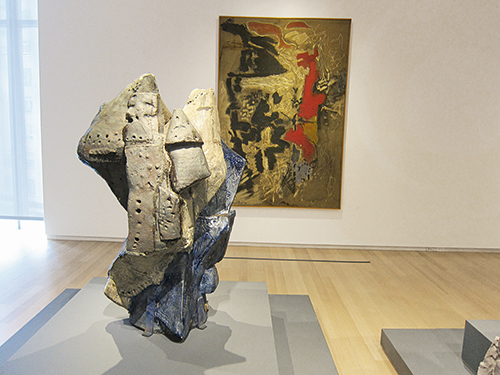 So I booked a flight to New York straight away and we met at the Museum of Art and Design on the last weekend of an outstanding exhibition: the Breakthrough Years (1953-1968) by Peter Voulkos (1924-2002). I had long been familiar with Voulkos from Ceramics Monthly and the monograph by Rose Slivka (1978). Susan Peterson, whom I met in New York in 1992, arranged a visit to his studio in Berkeley for me. He had a printing press there, one of his famous “stacks” and “ice buckets” were ready for firing. Regrettably, I did not meet the man himself as he was ill at the time. But I will never forget the atmosphere and the genius loci. A few years ago I visited Peter Callas because of my new kiln and found woodfired Stacks and Plates by Voulkos. These large, stacked, sculpturally developed vessel forms and plates were fired in Callas’s anagama in the 1990s. To see these probably world famous works up close was very special. Sasha Wardell was born in Sri Lanka in 1956 and has over 30 years experience in the world of bone china and porcelain having studied in two centres of excellence, namely Stoke on Trent (UK) and Limoges (France). 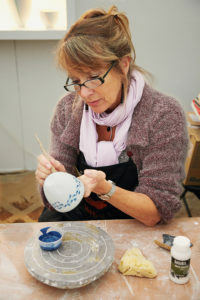 She presently runs bone china and mould making courses in the UK and France as well as continuing her own practice. Born in Nara, Japan in 1973, Kenji Uranishi is an Australian-based, Japanese artist who works predominantly with porcelain. However, the architecture-like structure is closer to an animal den in nature. The organic and the logical interweave and cooperate to build the flourishing natural environment of his homeland, Australia. 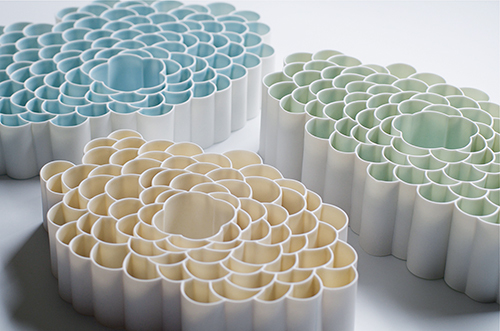 Julia’s objects are reminiscent of whirlpools, wheels, fancy hats, spinning tops, cocoons … In their ice colours, they seem to be frozen in their spinning motion and topple when they stand on a level surface. The artist tells us if this “motion” might have to do with “emotion” in the following interview. Julia, tell us something about your background please. My professional career began un-ceramically as an electronics installer. After nine years in the job, I decided to pull the plug so that I could finally do what I had wanted to do for years – ceramics. My dad had done some pottery with my brother and me when we were little, so I had had contact with clay right from my early childhood. Ceramics has accompanied me for many years now and the decision to make it my profession was very close to my heart, for which I had to make distinct sacrifices. I have given up the regular income I had before – but it’s been worth it! I have had my qualifications as a ceramic designer in my pocket since 2015 and now I am working on getting a foothold in the ceramics scene.